I received this book for free from ARC Tour in exchange for an honest review. This does not affect my opinion of the book or the content of my review. Once upon a time… there was a lot of hype for a series I was unsure of. It wasn’t my typical type read and I was very hesitant to give it a try. But I stepped outside my comfort zone and picked up the first book. I was hooked from the first chapter! That series was The Grisha series, by Leigh Bardugo. I adored each book and the series on a whole, completely, from start to finish. So when it became time to announce something new from this author and from the same world I fell in love with in the first place, I was instantly counting down, waiting to get enamoured once again. 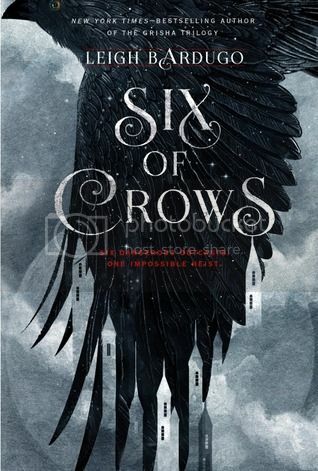 Six of Crows follows 6 outcasts as they try to pull of the impossible and break into an impenetrable court and rescue/kidnap their mark. The whole plan was extremely dangerous yet had an element of fun and adventure about it. I thoroughly enjoyed seeing how these characters would evolve their plan and get themselves in and out of such dangerous situations. Whenever a surprise was thrown their way, I myself would always be surprised with how these characters would find their way around it. It made it all very exciting to read. Each character has something to gain from pulling off this plan – be it revenge, salvation, and/or the hopes to turn their life around. The point of view does switch between them which was a huge plus. Not only did it allow me the chance to connect with each of them individually, but also allowed an opportunity to learn more about their past which led them onto this path of such a dangerous life. Kaz is the ring leader and always has something up his sleeve. He is a thief with a gift of magic and tricks. He is also very smart and calculating and I was hooked just to see what crazy thing he would think of next. Inej is the quiet spy with quite the gift for climbing. She is the epitome of silent but deadly. Nina and Matthias – the heartrender Grisha and the man who was trained to hunt her kind down. I adored everything about their story, past and present. Their love/hate relationship was probably one of my favorite things about this story. Jesper added a little comic relief. He is very handy with guns and a little too handy with gambling. He was very surprising in more ways than one. And the last member of this group of six is Wylan. He is extremely underestimated and I look forward to seeing him live up to his potential even more so in future books. The characters really made this story for me. I was fully invested in their lives and what would become of them. And being back in this world with Grisha was just amazing. There was a lot to love. Then why 4 stars instead of 5? The book was definitely a slow burn. I didn’t get that instant connection like I thought I would, like I did with Shadow and Bone. I really need to be captured and it took a little too long. But it was absolutely worth the wait when I did reach that point! I can’t wait to jump back in once again with the next novel! Leigh Bardugo was born in Jerusalem, raised in Los Angeles, and graduated from Yale University. These days, she hides out in Hollywood and indulges her fondness for glamour, ghouls, and costuming in her other life as makeup artist L.B. Benson. Her debut novel, Shadow & Bone (Holt Children’s/Macmillan) is now a New York Times Best Seller. She would be delighted if you followed her on Twitter, elated if you visited her web site, and downright giddy if you liked Shadow & Bone on Facebook. The Grisha series started great for me, and then slowly just didn’t. I like the premise of this book, but with all the hype surrounding it, I’m going to try and lower my standards a bit. Lol. OMIGOD I LOVED THIS BOOK SO MUCH. <3 the amount of joy I felt when I got an ARC was not even…ugh god. I loved Inej so much and then KAZ and can I say I ship Wysper so hard…? !